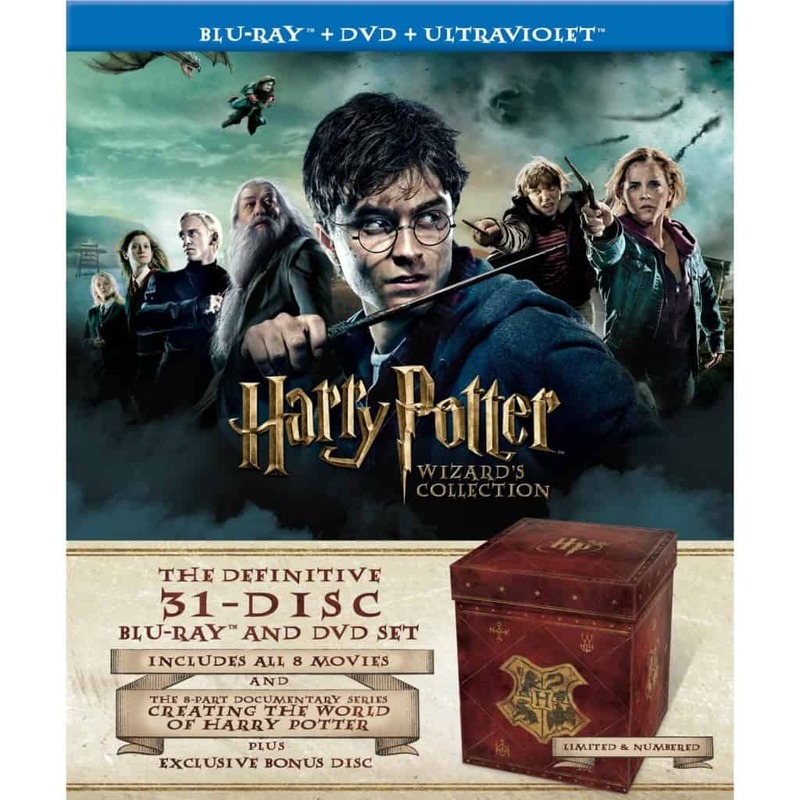 This 31 disc collection includes all the Harry Potter movies and special features. I don’t have the entire collection nor did I watch them all yet, but I did get a chance to take a look at the Special Features in the bonus discs! My daughter, Olivia, has read the entire collection of Harry Potter books and I’ve read the first three books many moons ago. We own all the movies except the very last one and they are always a hit with the kids. I was excited to learn more about the world of Harry Potter and see how the films were created. Creating the World of Harry Potter Part 7: Story: Learn how JK Rowling and screenwriter, Steve Kloves worked together on creating the script for the movie. Harry Potter and the Deathly Hallows- Part 1: Behind the Magic: Discover how one of the most complex scenes is set up and how the flying sequences were shot. The Return of the Order: Actors from The Order of the Phoenix discuss how they feel being back on the set. Scabior and Greyback: Learn more about the creation of Scabior and the vicious werewolf, Fenrir Greyback. Dobby’s Farewall: Watch interviews with David Yates, Daniel Radcliffe, Emma Watson and others discuss why Dobby’s death scene was so important and see what made him such a beloved character. The Look of Bill Weasley: Jany Temime, the costume designer, explains the choices behind the clothing and accessories worn by Bill Weasley to give him a rock star look. The Weasleys: Discover how the Weasley’s served as both a surrogate family for Harry as well as warriors in the fight against Voldemort. The State of Evil: Explore the dark side of the Great Wizarding War. The New Guys: Met the new actors in the film including Domhnall Gleeson (Bill Weasley), Rhys Ifans (Xenophilus Lovegood) and Bill Nighy (Rufus Scrimgeour). One Book, Two Movies: The producers and director discuss their decision to split the last book into two movies. The Wizarding Prop Shop: Check out the new props created by Pierre Bohanna, Prop Maker. The Seven Harrys: Daniel Radcliffe and the cast tell about what it was like to make the personalities of the scene with the seven Harrys just right. On the Green with Rupert, Tom, Oliver and James: Rupert Grint, Tom Felton and James and Oliver Phelps discuss their 10 years of friendship and what’s to come on the greens of the famed Celtic Manor. Dan, Rupert and Emma’s Running Competition: Dan, Rupert and Emma add some competition to the escape scene from the Snatchers in Swinely Forest. Godric’s Hollow/The Harry and Nagini Battle: Look inside the design of Godric’s Hollow, the home of the Potters. See how the special effects teams created the battle between Harry and Nagini. The Frozen Lake: Daniel Radcliffe and Rupert Grint talk about filming this scene and the difficulties of filming underwater. Creating the World of Harry Potter Part 8: Growing Up: Daniel Radcliffe, Rupert Grint, Emma Watson and other cast and crew talk about their experience growing up together on the set and how it shaped them into the people they are today. Harry Potter and the Deathly Hallows Part 2: Behind the Magic: Learn how CGI was used to create Hogwarts and see how the Great Hall was destroyed and then rebuilt three times during the film. A Conversation with JK Rowling and Daniel Radcliffe: Watch the intimate discussion how they bring the character of Harry Potter to life. Hogwarts Last Stand: Discover the huge amount of effort and energy required to bring the final battle to the screen. The Women of Harry Potter: Interesting exploration into the women of the film and how they don’t fit the stereotypes of female characters in fantasy-adventure movies. The Goblins of Gringotts: Actor Warwick Davis demonstrates the process of “Going Goblin” from tryouts to casting to actual filming. The Great Hall of Hogwarts: Cast and crew share their thoughts on what it was like to see the Great Hall demolished in the final battle. Ron and Hermione’s Kiss: Takes a look at their romance throughout the series. That’s a Wrap: Cast and crew discuss what it was like after reaching the finale after a ten year long process making the Harry Potter movies. Neville’s Battle Makeup: See the task of creating the bruising and bloody looks of the characters in the final battle. The Gringotts Disguises: Helena Bonham Carter discusses the challenges of playing Hermione in disguise as Bellatrix. Warner Bros Studio Tour London: The Making of Harry Potter: Visit the UK’s newest attraction and go behind the scenes and see the actual sets, costumes and learn more about the movies. Pottermore Preview: JK Rowling introduces her new site, Pottermore. When Harry Left Hogwarts: Listen to the emotional stores about the final days on set. Designing the World of Harry Potter: See how JK Rowling’s world was brought to life on screen and how the design evolved. Secrets Revealed! Quidditch: Learn how the Quidditch scenes were constructed. Secrets Revealed! Hagrid: See the camera tricks, towering stand-in and large body suites required to make Hagrid twice as tall and three times as wide as the average man. The Harry Potters You Never Met: Meet the body doubles for the main cast of characters and how they had to mimick seamlessly the actors they represent. These bonus discs provide a HUGE amount of information and will keep you busy watching it. Fans of the movies will love this behind the scenes look! I’m always fascinated to see how movies are made. I learned that the chase scene in Part 1 of Harry Potter and the Deathly Hallows was shot in 7 locations and took 6 months to even design the sequence. When all was said and done, it took 14 months to finish this scene that was under 2 minutes long. It gave me a new appreciation for the cast and crew now that I’ve seen just how much work goes into making these movies. I would love to get this collection and watch the films again in order so I can take special notice about some of the things I learned from the bonus discs. This collection is now available for you to own! This would be a treat to watch as a HUGE Harry Potter fan like me. Dear Stacie, please read all 7 books! You will love them! As a huge Harry Potter fan and as the mother of 2 Harry Potter fans, I can say this set would be a huge hit in my house. I must say, we love the books more than the movies, but this is something to consider for Christmas! That sounds great! thanks for detailing what was included, sometimes it is so hard to figure out! thanks for the review… last year (or the year before? i don’t remember) ABC family did a Harry Potter marathon and had a lot of behind the scenes things – and i loved it, so I’m sure this would be amazing! Wow… 31 discs! That’s intense. My niece loves this series… but I haven’t read them yet. I hear they’re fantastic. I have to say that I am a Harry Potter fan! I have read some of the books from Harry Potter, and I have some of the movies! I find the characters to be so interesting! These movies take me to a different world where there is make believe scenes! Like so many characters! An essential item to any Harry Potter fan. My niiece loves harry potter. Thinking about getting this for her birthday coming up! what an amazing collection! anyone in my family would love this!